Cleanup included the removal off-site disposal of PCE-impacted soil. A groundwater monitoring well network was established in the area of PCE release. Groundwater monitoring was performed to demonstrate a stable or receding groundwater plume. The entire site was capped to minimize the potential for direct contact with widespread sporadic PAH and metals impacts to soil. 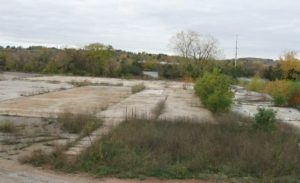 The Wausau Riverlife Villages project phase 1, which includes $27 million worth of multifamily and mixed use commercial buildings, recently completed all foundation work and is currently on schedule for completion in 2019. Wausau on the Water (WOW) – a $3.5 million family entertainment center with a bar, grill, arcade and laser tag facility – recently celebrated its first anniversary in operation. 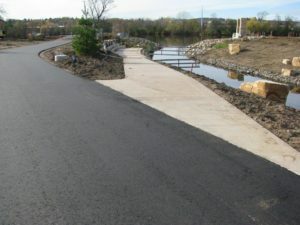 The city of Wausau completed phase 1 of the public improvements to the 16 acre Riverlife area which included a river wharf, extensive river’s edge trail connections and plazas/overlooks across the site last year – all of which provided new public access and recreation opportunities. The city is currently bidding phase 2 of those amenities to be completed by fall 2018, which is scheduled to include a concession/market building, rope courses and climbing walls, fitness equipment and other recreational amenities in the new Riverlife Park.